Yesterday the Treasury Department announced that 630 Americans renounced their U.S. citizenship in the fourth quarter of last year, bringing the total for 2013 to 2,999 – almost double the previous record set in 2011. 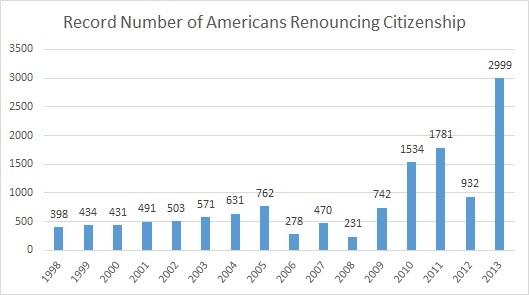 In the last four years 7,246 Americans have renounced their citizenship, far exceeding the total number that left in the twelve years before that, 1998-2009. See the chart below.